The media is providing hypnotists with an avalanche of free advertising. Every time one of these articles appears in a national publication, my phone rings off the hook. Yours will too! Expert proof - hypnosis is now being accepted! Hypnosis was approved by the American Medical Association in 1956. In fact, hypnosis is being used in health care facilities across the nation. The use of hypnosis is sweeping the nation. 1) 1989 Surgeon General Report to Congress on nicotine addiction reports hypnosis is a viable means to stop smoking. 2) Hypnosis emphasizes the required phases of learning: understanding, assimilation, integration and application. Of course you can! During the seminar, you’ll have many opportunities to hypnotize others. In fact, you’ll be learning a secret technique to give you the confidence and ability to do a hypnosis session without a script! This is an exciting, proven method! Using hypnotherapy skills will help you create change at the subconscious level. Changes will be quick and long-lasting. This is the reason people need and want hypnosis to help them change easily and effortlessly. It’s an incredibly rewarding and exhilarating experience. • The one thing you must do to make yourself stand out from the crowd. • How to get your fair share of free publicity. • 3 New services you can offer as a hypnotist, and why people will be knocking down your door for these services. • What your best advertisement is, why it’s free, and how to double it. • A simple way to avoid costly mistakes in advertising. • 4 Main indicators of rapport and how to automatically recognize these with your clients. • Pacing, matching and mirroring - how to use these with your clients for unbelievable results. • How to establish instant rapport with clients - even the resistant ones. • How to tell which people make the best subjects. • 2 Fast and easy tests to indicate which hypnotic induction will be most effective for each client. • A simple way to measure how deeply a client has gone into hypnosis. • 6 Little known ways to enhance and deepen a hypnotic state to achieve your results much quicker. • Times when you should never hypnotize someone and why. • The power of presuppositions and how to use them for amazing results with your clients. • 5 Keys for formulating the most effective suggestions. • 18 Incredibly powerful Ericksonian language patterns and how they automatically induce a trance state. • How to artfully use multiple embedded metaphors to facilitate change. • The power of sequencing and ordering of language. • How to avoid simple mistakes that could lead to disaster. • Learn some of the closely-held secrets of NLP. • Post-hypnotic suggestions and why they are so powerful. • How to use indirect suggestions to emphasize important concepts at a subconscious level to help your client reach their goals quickly. • Distraction/confusion . . . or how to get rid of an “overactive” conscious mind. • Regressions: how to ensure your client's safety. • Hypnosis and anesthesia - simple exercises to show the power of the mind over the body. • Hypnosis for stop smoking, weight loss, enhancing learning, memory, and stress reduction - learn which techniques are most effective for each area. • Ultradian Rhythm Cycles - how you can use them to actually go home refreshed at the end of the day. I’ve seen so many people get stuck because they only had learned hypnosis inductions by reading a script to their clients. If you’ve ever had a telephone salesperson call and read you a script over the phone, then you know exactly what I’m talking about. It’s a canned, monotone, unconvincing induction. I’ve discovered and put together an incredible, easy, paint-by-numbers way for you to learn to do customized inductions automatically, which have a tremendously powerful impact on your client. Once you’ve learned this system, your confidence increases, your results are assured and you’ll feel like you’ve been doing hypnotic inductions for years. And more importantly, your clients will trust you because of their extraordinary success. I’m talking about the ability to recognize, utilize and custom design... Your Own Trances! As an example, all of my best seminars and courses were created while in a PROFOUND trance generated throughself-hypnosis or meditation. I sincerely believe learning self-hypnosis will have a profound impact on people’s lives in the new millennium. by-passed so your full measure of creativity, wisdom, intuition, talent and genius can come out. In other words, unless you learn to design, utilize and benefit from trance states you will never touch your true talents or live the life you were meant to live. Looking throughout history, you’ll see this is true. possess this knowledge? Now you can with our . . . I feel so certain that you’ll be absolutely delighted with this training, I’m offering you a 100% Money Back Guarantee. If, for any reason, you feel the seminar isn’t for you, turn in all materials by 1 P.M. on the first day, and you’ll receive a full refund. • Transcripts - to help you retain the knowledge and give you ideas for your sessions. • 2 Prestigious certificates on parchment paper, suitable for framing. Coaching - 2 hours with Daniel after the seminar is over to answer any of your questions. With your training, you receive $700 worth of free bonuses absolutely free! This will assure you that you will truly learn the material and GET IT! 1. Each time you listen to the CDs, you’ll gain more & more confidence in your ability to help yourself and others! 2. The information revealed in all this material is invaluable! You’ll get ideas and insights for clients, marketing, what has worked for others & how to ensure your success! stimulating creative ideas for you! 4. You’re free to study and review the study materials at your convenience! 5. You’ll be able to review the precise language which puts people into trance, hearing all the intonation, pauses and sequencing. 6. Advanced techniques, strategies and inductions which will make you a better hypnotist. 7. Learn the Master Formula to building a phenomonal induction each and every time. The more you listen to this pattern, the easier it will be for you to do great inductions every time. 8. Because you’ll have the transcripts of a seminar, you’ll quickly be able to review and understand at a deep level any part of the seminar. You can also review any inductions or specific language patterns. 9. All of these things will help you with repetition! Repetition is absolutely essential for the subconscious mind to learn! Pre register 10 Days or More In Advance and You'll Receive 1 Hour of a free consultation with Daniel Olson - $150.00 Value! Daniel will be there for you to answer your questions about client problems, what strategies to use when, super marketing strategies . . .and much, much more! I sincerely hope you will seriously consider attending this transforming seminar! Think about the valuable benefits and tremendous satisfaction you'll receive because of this decision! As Mike Murdock says: "If you want something you’ve never had, you’ve got to do something you’ve never done." To change your life, you must have the tools. Learning hypnosis will change your life. Do it for yourself. Do it for your family. The recognition you get and the tremendous value will just be a great bonus. It’s very easy to get started . . . just send or call in your payment and we’ll get your confirmation right back to you immediately! I’m looking forward to hearing from you soon! Call for upcoming dates or to sponsor a seminar in your area. Classes are intentionally kept small for individualized attention, learning and get all your questions answered. Click the buy now button to pay your $300 deposit for this seminar. He has been helping people create happier and more fulfilling lives for themselves and others since 1981. 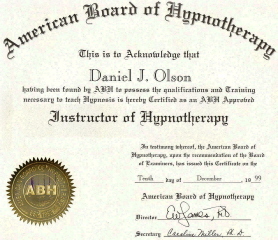 He is a Certified Master Hypnotist and an Approved Hypnosis Instructor. He is the founder of the Advanced Hypnosis Institute and is also the creator of the powerful change device called Neuro-Acceleration. He has helped thousands upon thousands of people make valuable changes with hypnosis since 1982. “You get what you focus on, so focus on what you want!” Thank you. P.S. - 100% Money Back Guarantee - attend risk-FREE! If, for any reason, you don’t feel the seminar is for you, return all seminar materials in their original condition by 1:00 P.M. on the first day and receive a full and cheerful refund. P.S.S. - Remember these classes are intentionally kept small. This means your training is custom tailored to ensure personal attention, that all your questions are answered and that you really get it. P.S.S.S. -You Can Either Attend Free Or Get A Discount: Refer your friends (who aren't in the Olson & Associate's current database) and get a discount off your tuition. You will receive $200 off for each referral!